Moneydance is a budgeting tool that helps you track spending and income across numerous financial accounts, including bank, credit card, investment and loan accounts. Whether you are sitting at your desk or on-the-go with an iPhone or Android device, Moneydance lets you view balances, enter and edit transactions, and generally stay on top of your finances. If you struggle to stay within budget from week to week when spending on utilities, groceries, rent, food, and other day-to-day items, Moneydance provides the notifications and reminders needed to keep you on track financially. With so many budgeting apps on the market, it may be hard to know whether you are selecting the right one for your needs, so Moneydance earns brownie points for providing a free trial that lets you get started at no risk and a 90-day money back guarantee. 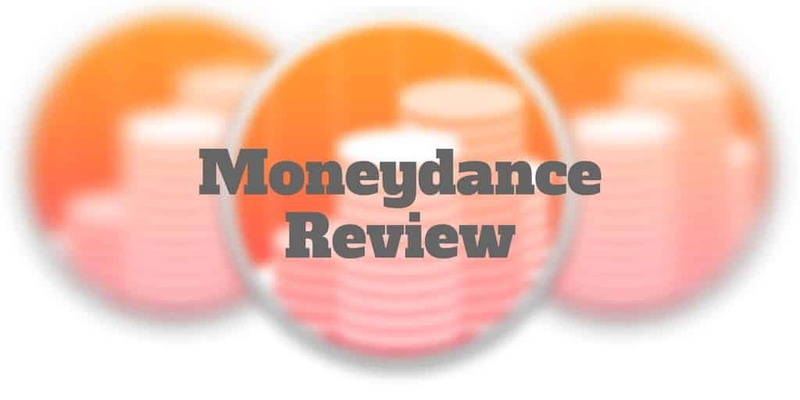 Is Moneydance a Good Value for the Price? Before getting to the many ways in which Moneydance shines, let’s first start with the gorilla in the room, where it falls short. If you visited the Moneydance website, which is now operated by The Infinite Kind company, you would be forgiven for thinking the website lacks polish. In a world where Apple-like simplicity and design is the norm, Moneydance has the feel of a cluttered website. But if you can get past the so-so first impression, you will find much to like. If the thought of manually typing into a spreadsheet every financial transaction you have made over the past 12 months seems daunting, then Moneydance can save you time and hassle. You can automatically download financial transactions and send payments online from hundreds of financial institutions. Plus, Moneydance learns how to automatically categorize and clean up financial transactions. If you are like most people, you probably have a bunch of accounts that you log on to regularly, including bank accounts, credit card accounts, and loan accounts. 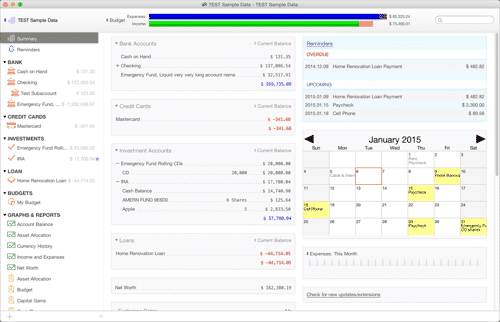 Wouldn’t it be nice to view all your financial accounts in one place on a single dashboard? By keeping all your accounts in one place, you can spot whether any transactions have been processed in error and any fraud has taken place on any account. You can also reconcile any accounts against financial statements as well as enter new transaction details. Spending can creep up on you and leave you short of cash to pay bills if you are not keeping a close eye on where your money is going. Moneydance makes it easy to visualize how much money is being spent on what areas over a particular time period. 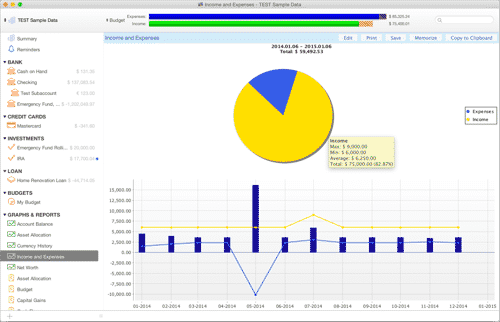 In its Graphs & Reports section, you can view income and spending quickly for any time period. And you can display the finer details about your spending habits by hovering your mouse over expense items. Plus, if you want to save or print files, it’s quick and easy. If you spot something out of whack in any financial account, you can make changes or enter new data altogether if necessary. You can think of it as a digital representation of balancing an offline checkbook, except that balances and sorting of transactions is done automatically for you. Late fees are more than a pesky nuisance. At the end of each year, if you were to add up how much you pay in penalties by not making timely bill payments you might be surprised how much it costs you. The idea behind Moneydance Reminders is to set notifications to remind you when a bill payment is due. You can schedule reminders for both single and recurring transactions. 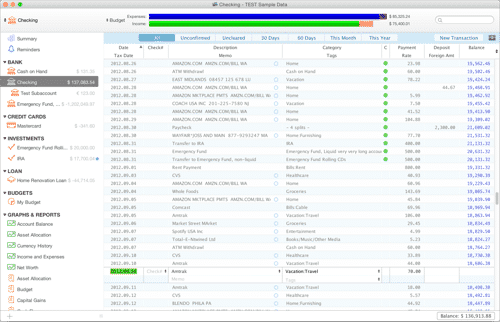 Whether you are an Apple or Android user, Moneydance syncs your financials across devices to allow you to view your accounts on your desktop at home or when you are on-the-go. Changes are synced right away and securely with your desktop to ensure you don’t experience any version control issues with out of date data. While budgeting apps are common, few provide investment account support. Moneydance stands apart from many of its rivals by making it easy to track stocks, bonds, CDs, and mutual funds. You can see your overall account values as well as the performance of individual securities. Plus, data that can ordinarily be difficult to keep track of, such as stock splits and cost basis computations, are tracked automatically. Over and above the standard features, Moneydance has some perks for Quicken users and subscribers with financial accounts in multiple countries. Moneydance can support multiple currencies so if you have accounts in different currency regions, you can convert them to a single currency. 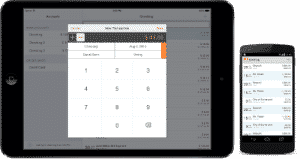 Budgeting apps are designed to save you the time and the hassle of manually importing transaction data. At Moneydance, you can import multiple file formats from other budgeting tools, including OFX, QFX, and QIF. Whether you are a Mac, Windows, or Linux user, Moneydance caters to all formats. Download the app and click the zip file. Drag Moneydance from your Downloads folder to your Applications folder and double-click it, and then you are good to go! You can choose to download the Windows Installer 32-bit or 64-bit. Once downloaded, simply double-click the file and the app will install on your desktop. After downloading, simply double-click the moneydance_linux_x86.deb file to install. The installer usually places the file in /opt/Moneydance but the GUI-based installers will prompt you for the location to install Moneydance. Moneydance wins points for connecting more than bank accounts, credit cards, and loan accounts – it also supports investment accounts. 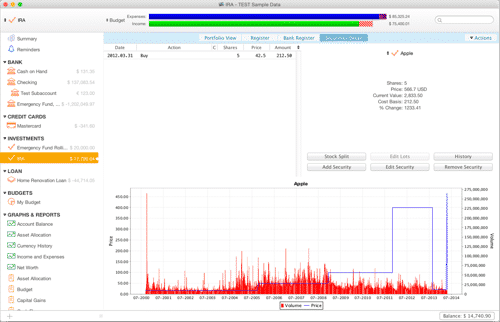 Plus, it acts as a very good substitute for Quicken for Mac. Plus, Moneydance is supported on iPhones, iPads, and Android devices. ✅ Low Price Budgeting Tool: Relatively inexpensive to purchase Moneydance, which compares well to many other budgeting apps, some of which have steeper billing prices and recurring schedules. ❌ Dashboard & Website Polish: The look and feel of the Moneydance website could be improved to reflect the quality of the app from a functional perspective. As is, it looks somewhat dated. ✅ Sync All Accounts In One Place: Many budgeting apps will connect your bank accounts, credit cards, and loan accounts into one dashboard view but Moneydance goes a step further and connects to your investment accounts too. ❌ Quicken Export: If you do wish to export from Quicken, you will find the process bit more clunky than it needs to be. 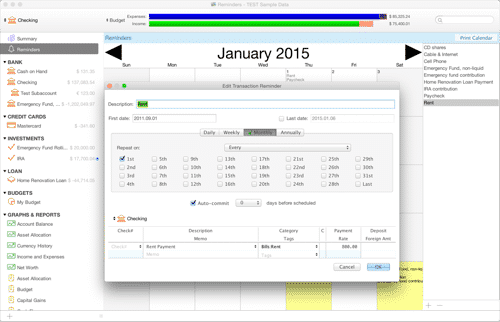 ✅ Quicken For Mac Substitute: If you previously had been a fan of Quicken for Mac until it no longer came standard with a Mac purchase, then Moneydance will act as a good substitute. ✅ Mobile App: Both Android and iOS operating systems are supported, so you can use it with iPhones or any Android phone. ✅ Bill Pay Notification Alerts: When bills are due, Moneydance lets you set one-time as well as recurring reminders to help you pay on time and avoid late fees. ✅ Reconcile Transactions: To help you detect irregular charges or fraud on any of your accounts, Moneydance helps you to digitally “balance your books” and reconcile transactions. ✅ Free Trial & Guarantee: Not only do you get to sign up free to test out the software but, if you like it, you also receive a 90 day guarantee. ✅ Currency Conversion Support: If you have accounts in different currencies, Moneydance supports multiple currencies. ✅ Security: Moneydance software runs on customers’ computers or mobile devices with data fully encrypted. Moneydance conveniently gathers into one place your financial information relating to bank accounts, credit cards, and investment portfolios. Having so much information in one location makes it easier for people without accounting experience to monitor their finances. Moneydance also uses color-coding and graphs to make financial information more digestible for consumers. While Moneydance cooperates with most financial and investment accounts, it has trouble importing data from other financial apps. For example, many customers find it difficult to import information from Quicken. If you currently use software like Quicken, then you will need to take a close look at Moneydance’s imported data to find duplicate and missing items. The wealth of information that Moneydance gives you can also make it difficult to find the items that you want. The graphs certainly help when reviewing investments and spending habits. But if you want to find a specific bill payment, you may have to wade through a lot of entries before you find the right one. Moneydance is an accounting and budgeting app that helps people take control of their finances. It competes with similar accounting software options like Quicken, You Need a Budget, and Mint. Moneydance charges $49.99 per year. A free trial limited is available up to 100 manually entered transactions, so you can give it a test drive to decide whether you want to buy the app. Compared to Quicken and similar apps, $49.99 is a fair price considering that you get tools for budgeting, investing, and paying bills on time. Quicken charges about the same price for these services. You can, however, find free apps like Mint and Personal Capital that work equally well. You may not get as many features from the free apps, but that may not matter much depending on your needs. Regardless, you should explore your options and take advantage of Moneydance’s free trial before you pay for the software.